Dendrobium Garden » Dendrobium chrysotoxum Lindl. 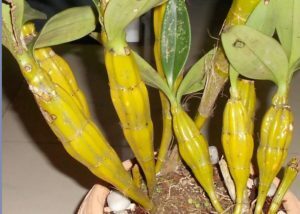 browse:Home Dendrobium Dendrobium chrysotoxum Lindl. Dendrobium chrysotoxum Lindl. is a herbaceous plant. Stems erect, fleshy, spindle-shaped, 6-30 cm long, 1.5-5 cm thick at middle, with 2-5 nodes, with mostly rounded oboviate ribs, golden yellow after drying, 2-5 leaves near top. Leaves leathery, oblong, as long as 19 cm, 2-3.5 cm wide or wider, apex acute and hooked, base narrow, but not extended to the sheath of the sheath. Occurred near the top of the stem of racemes, oblique or slightly sag, up to 20 cm; inflorescence axis stout, sparsely flowered; inflorescence base with 4-5 sheaths; bractlets small, membranous, ovate-lanceolate , 2-3 mm long, apex acute; pedicel and ovary yellow, up to 5 cm; flowers thick, golden yellow, slightly aroma; sepals oblong, 1.2-2 cm long, 5-9 mm wide in the middle , Apex slightly obtuse, with 7 veins; lateral sepals and sepals nearly equal; septum near spherical, 4 mm wide. Petals obovate, as long as middle sepals, ca. 2 × as long as sepals, apex suborbicular with ca. 10 veins; lip color more than sepals and petals, nearly kidney-shaped, ca. 2 cm, Cm, apex shallowly 2-lobed, much reddish striate on both sides of base, undulate, densely napose on top; lip plate usually “Λ” raised, sometimes with “U” chestnut patch; Caps light yellow, spire. Flowering from March to May. Born in 520-1620 meters above sea level, sunny on the evergreen broad-leaved forest in the trunk or the rock under the sparse forest. Production of southern Yunnan to western China (Shek Ping, King Valley, Simao, Mengla, Jinghong, Gengma, Zhenkang, Cangyuan). Distributed in northeastern India, Myanmar, Thailand, Laos, Vietnam. Specimens collected from northeastern India. Dendrobium chrysotoxum Lindl. is a kind of cool perennial herb, like in the warm, humid, annual rainfall of more than 1000 mm, half-shade half-sun environment, the average January temperature above 8 ℃ in the subtropical forests grow deep forest is better , Suitable for growing temperature of 15 to 28 degrees, suitable for growing air humidity above 60%, less demanding on soil fertility, wild and more in the loose and thick bark or trunk growth, and some also grow in the crevice. Is an aerial root, the main requirements of the root permeability is good, the best substrate to breathe air ventilation, in the appropriate temperature and humidity, fast growth, survivability is very strong. Spring and early summer each year, biennial stems on the section of the inflorescence, after flowering stems grow into new stems into stems, autumn and winter into the dormant period.